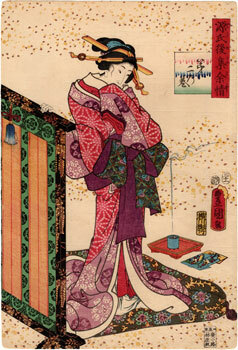 Gorgeous polychrome woodblock print of large vertical format, right panel of a diptych made in 1857 by the famous artist Utagawa Kunisada (歌川国貞). 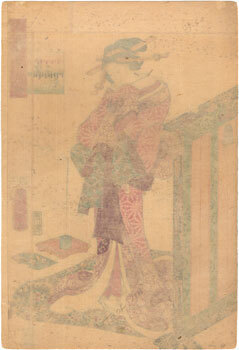 The work is taken from the series "Lingering Sentiments of a Late Collection of Genji" (源氏後集余情) and is dedicated to the second chapter (第二乃巻), "Hahakigi" (ははき木), of the novel "False Murasaki and a Country Genji" (偐紫田舎源氏) by the writer Ryutei Tanehiko (柳亭種彦). The novel "Nise Murasaki inaka Genji", this is the Japanese title of the work, was published in episodes from 1829 to 1842. It is a story of historical setting, which is not a simple parody of the famous Genji Monogatari (源氏物語), but it is enriched by adventurous and dramatic elements elaborated by Chinese novels and by the kabuki theater. Its popularity was partly due to the splendid illustrations of Kunisada which, following the wave of great commercial success, reworked and reproduced his illustrations also with the fine series of woodcuts of which we present an example here. The print, made by the engraver Yokokawa Takejiro (横川竹二郎) and the publisher Hayashiya Shogoro (林屋庄五郎), is in very good general condition thanks also to a relining carried out on the back.